Meet our first pattern for the new year – the Bondi Dress. If she looks a little familiar that’s because she is! 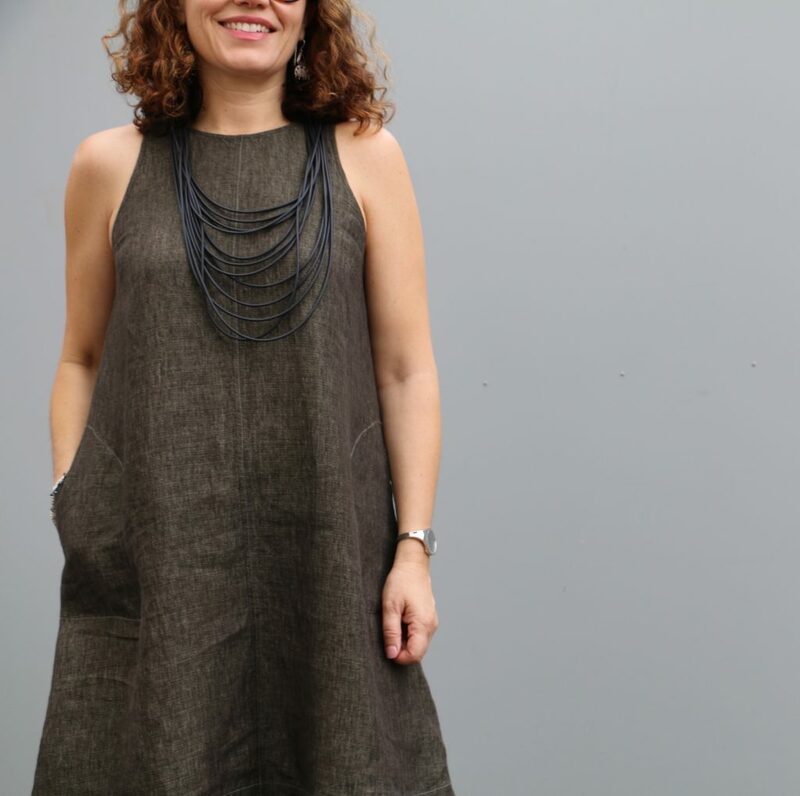 Back in March 2016, we published this blog post showing you how to modify our Ruby Dress pattern. Since then, we’ve had SO many requests to release it as a stand-alone dress pattern that we finally decided to do just that but with further improvements. The Bondi Dress is sleeveless and features a high neckline, cut-away armholes, bust darts and side pockets. 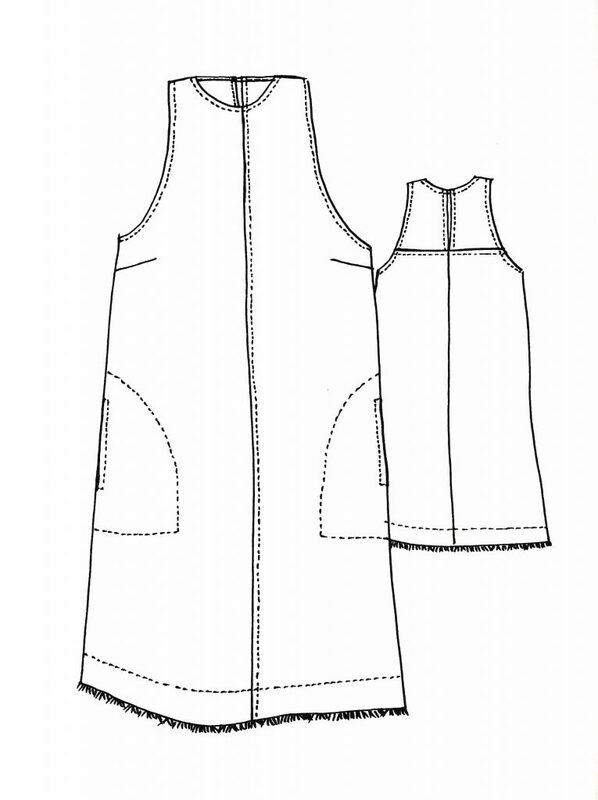 There is a centre front and back seam and back yoke with neck opening. The gently flared hem is finished with a facing, as well as an optional fringe edging, and comes in two length options (longer length A and shorter length B). Gabby’s yellow version (above – shortened by an extra 5 inches to suit her preference) is made up in our Golden Wheat Leon. The white one (below) is made up in our popular Pebble Wash linen with fringing in Hartford White. 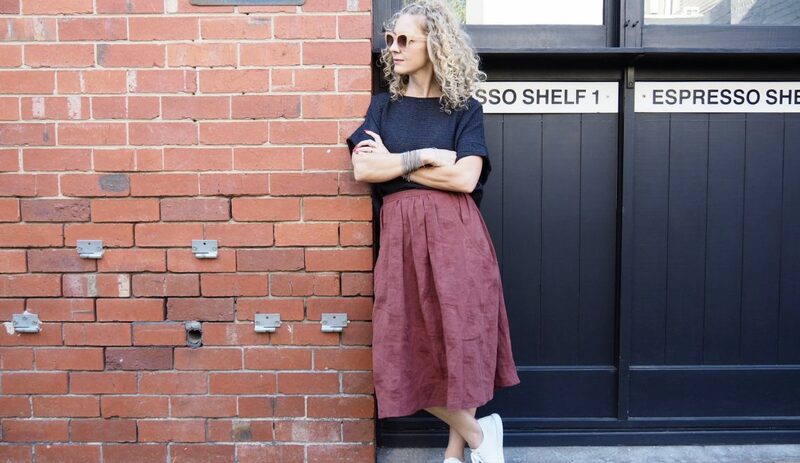 Colette’s Bondi (below) is made up in our Dark Moss Leon (other colours here). 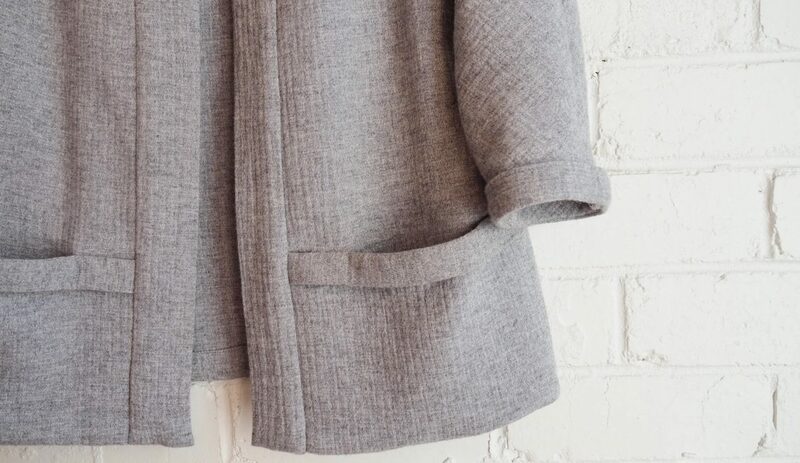 For an added design detail, she topstitched her hem, facings and pockets in a lighter sage-coloured thread. 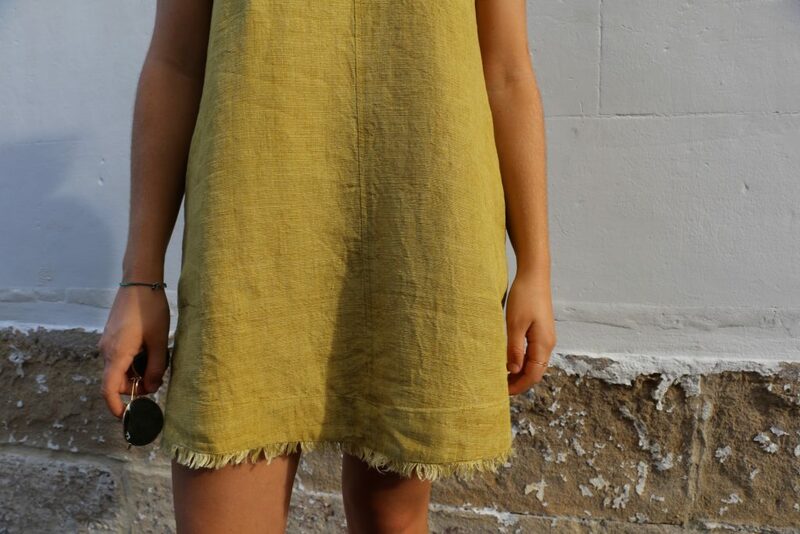 Named after Australia’s iconic Bondi Beach, this dress really is the perfect summer style. 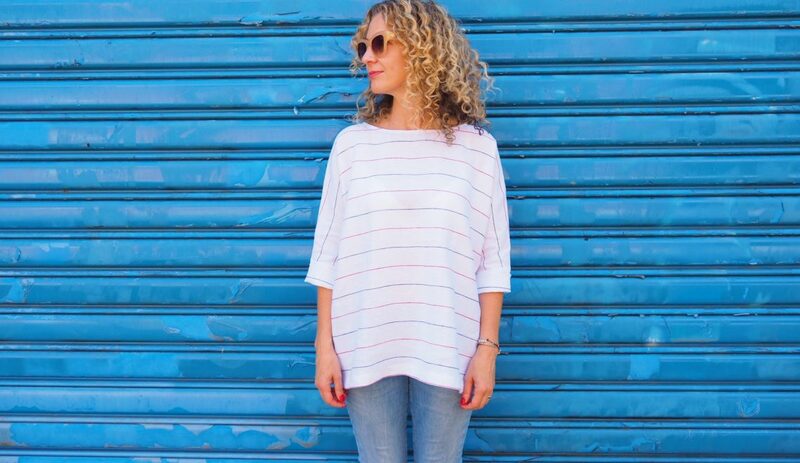 Think hot days, balmy nights and the perfect go-to wardrobe item for comfort and cool. Suitable fabrics include medium weight linen or linen blends, cotton, medium weight silk or silk blends. 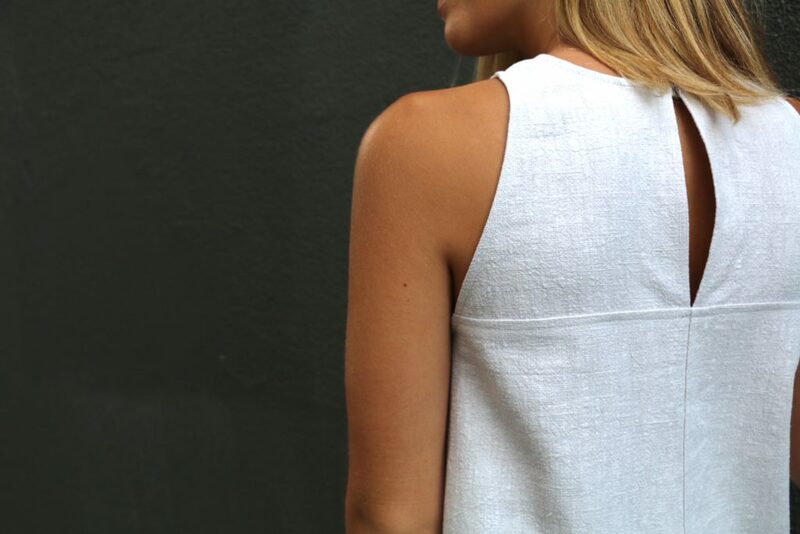 The Bondi Dress is now available in Australian sizes 6-16. She’s currently available in PDF (print-at-home/print copy shop version) or, if you prefer, you can purchase the hard copy (for a limited time) online. I love this dress! I have a Piper dress that is almost the same (minus centre seam), so pleased you’ve obviously taken inspiration from it. I’ll visit in store I’d youre open Saturdays so I can decide which colour fabric to buy! This is a lovely pattern! Gorgeous pattern! The only thing that puts me off is the fact that I#d have to wear a strapless bra with this – I don’t care what SJP does, hate visible bra straps – which immediately means discomfort. Oh to find a decent strapless which isn’t wired, padded, and hot – but still works if you’re a 36 D….. I just wear a bra with a cross back. Easy! Thank you so much for asking this question! Also thanks to Lisa for her way of dealing with it! Another solution would be to add more width (to front and back) at the shoulder and blend back to the original armhole. This way you can wear your regular bra and the wider shoulder line will cover your bra strap. Thank you Colette! That’s one to try till I get the cross strap bra :). Hi- just wondering if you had a suggestion for my query? I’d be keen to make this but would quite like to hear from you before I do. Many thanks in advance ? You can email your enquiry to fabrics@tessuti.com.au. Thanks for the reply Colette. I’ll do that. I don’t see any references to the plus sizes advertised in the recent email … Oh, I see – the email had the wrong link in it. Sigh. How is the fringeing done please?? It’s a bias strip that sits between the dress and hem facing. Do I cut off the edges of the pages at the dotted lines before taping together the pattern? Hi Deb. There are several ways you can assemble a PDF pattern. Try googling ‘assemble PDF pattern’ and you can see a number of different methods. Some trim all edges, some trim only some. Whatever method works best for you!